Members will get an inside look into how some of the most high performing companies in the industry are leading their sales teams at the 2019 Sales Management Forum. We’ll dive deep into how members have structured their sales organization, where they’re finding their top talent, and how they’re keeping them inspired and motivated. We’ll also spend some time talking about the tools members are using like CRM and Maintenance Estimating Programs, but will focus more on how to implement a good process more than specific products. Developing KPI’s: We’ll talk about how to give sales people a roadmap of expectations to help lead to more closed opportunities. You’ll get ideas on different things to track, tools members are using to measure activity, and what to do with that information. Recruiting Sales People: Where are you finding your top talent? Members will share how they’re recruiting new sales people. We’ll also hear from Mark Connelly with Culture Index about the criteria we should be looking for to recruit the ideal sales person. Compensation Plans: We’ll spend time sharing the unique things that each member does. You’ll also hear from a panel of members who have implemented team selling and compensation to their sales group. Marketing: What are the most impactful marketing tools you should arm your sales team with? Members will share the things that have helped them and we’ll give you a few more ideas of small things that can make a big difference in staying top-of-mind with your clients and prospects. Don’t miss this opportunity to learn and share with the industry’s best and brightest! 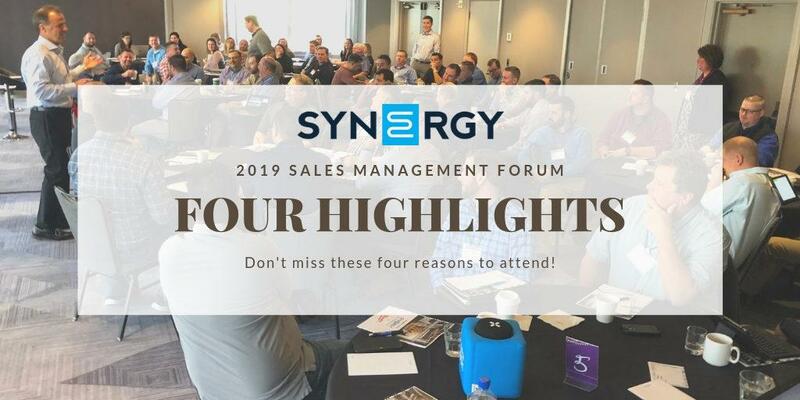 Members can register here – https://www.synergysolutiongroup.com/events/2019-sales-management-forum/. If you’re not a member but interested in attending, please contact Allison Rodgers at allison@synergysolutiongroup.com. Registration deadline is May 24th.